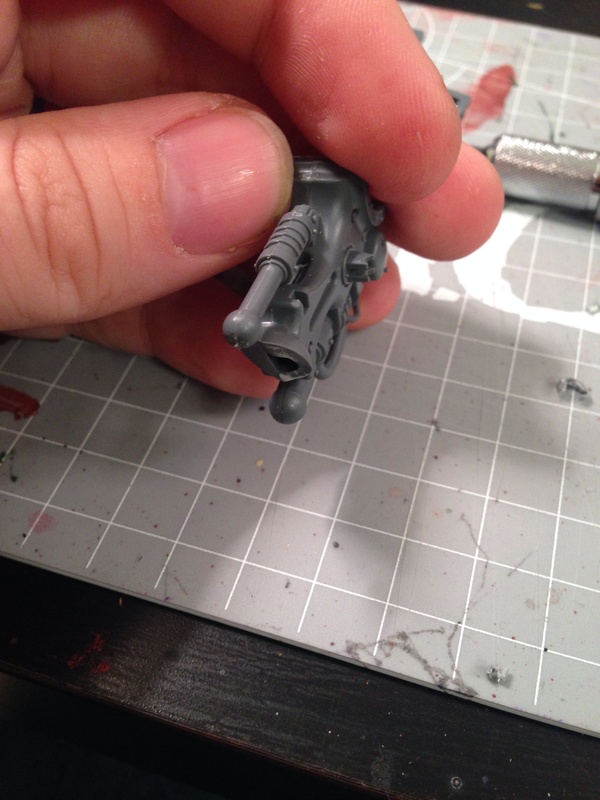 With my first Imperial Knight built, I decided that I should make my second knight more dynamically posed. 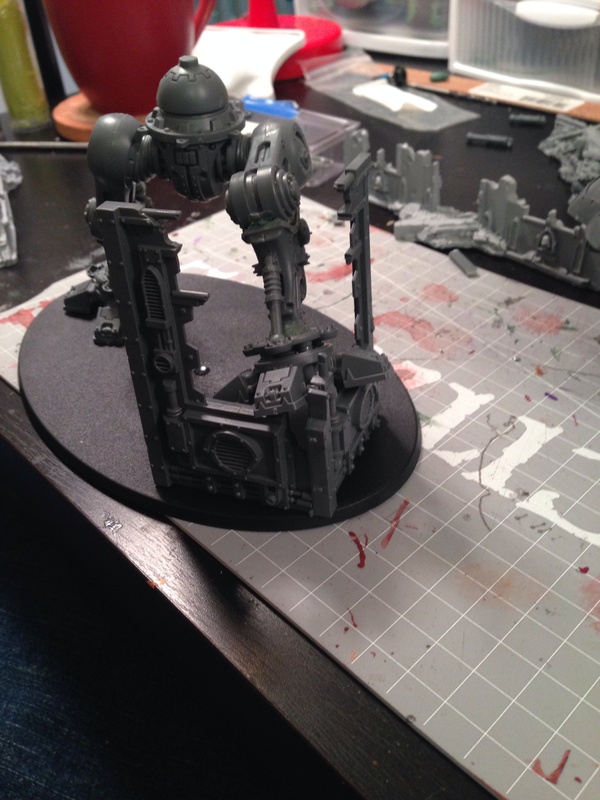 The only real problem I have with the Imperial Knight Paladin/Errant kit is that the legs are only able to be built in a single pose, as opposed to the other recent large walker models from GW, such as the Riptide and Wraithknight, whose legs have locator pins to lock the legs in a set pose but that can be cut if you want to make them more posable. I decided that having the knight with one leg bent up more and resting on some ruins would make for a nice, dynamic pose. 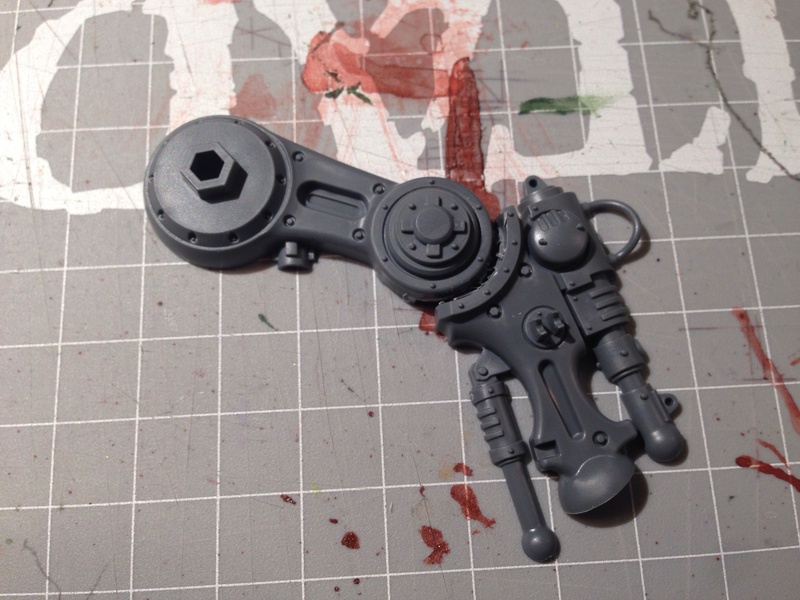 To do this I started by carefully cutting through the leg pieces at the knee joint before I glued them together. I then cleaned up the cut and glued the halves of the upper and lower legs together. It looks like the leg mounts to the foot with a ball and socket joint at the ankle, but it is actually a flat mount sculpted to appear as such that locks the foot at an angle matching the original stance of the knight. 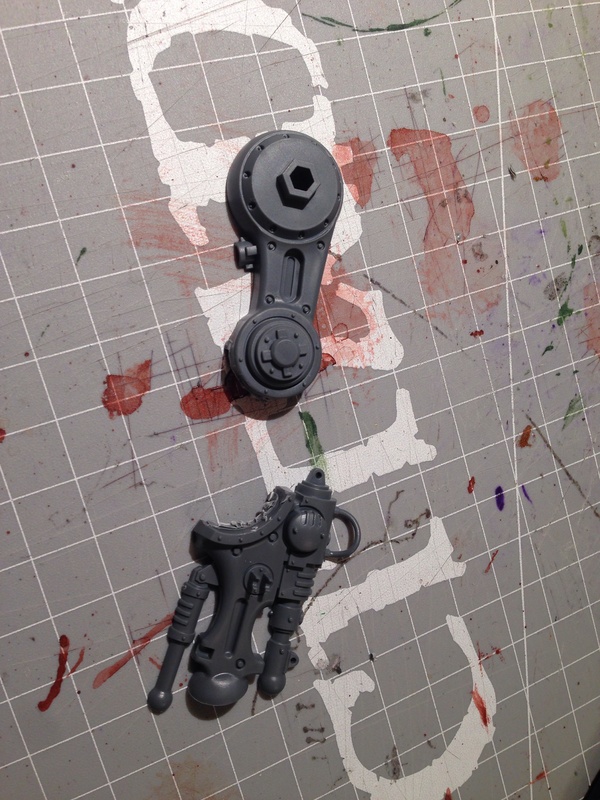 To position the foot straight with the leg, I had to shave off one side of the pseudo-ball joint. 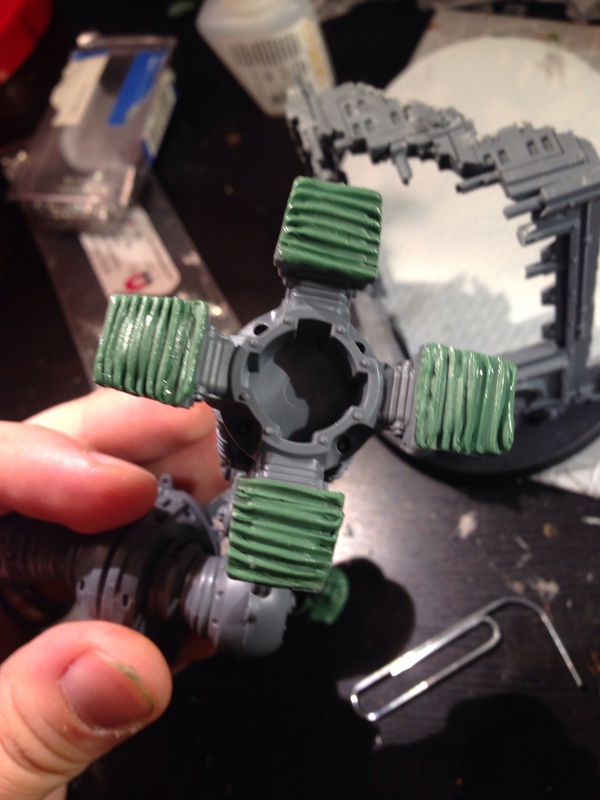 I then placed some green stuff into where the ankle ball would be and squished the pieces together; I sculpted the overflow green stuff into a ball. After scuplting the fake ball joint ankle, I reattached the two leg pieces at more of a bent angle than the leg was originally posed; I put a suppot armature made from sprue inside the leg to give added lateral support. 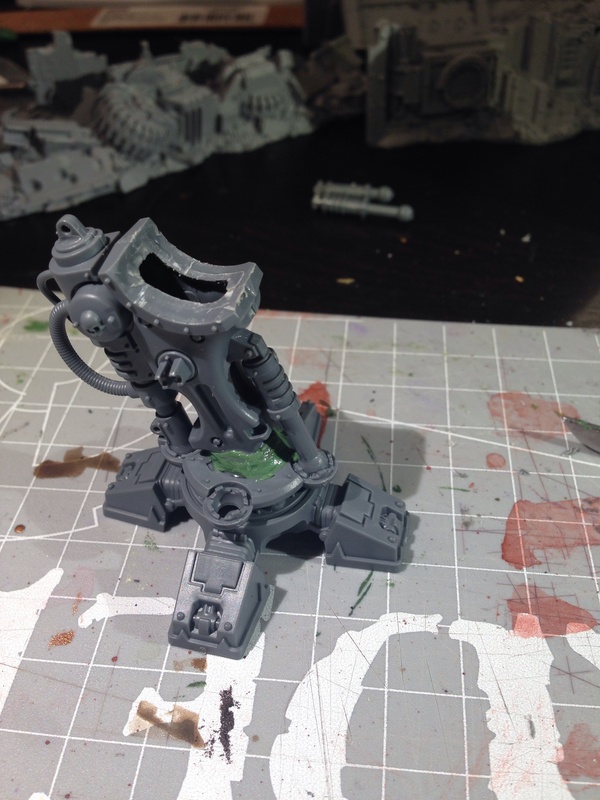 The pins which attach the legs to the hips are hex shaped and luckily turning the bent leg forward one side further are the hex positioned the leg in such a way that I could leave the other leg positioned as normal and have the knight’s other leg standing atop some ruins. Leveling out the raised foot causes the two lateral pistons on the ankle to no longer be the right lengths; conveniently one needs to lengthen by the same amount the other one needs to shrink by, so I cut out the middle of the longer piston and pinned it into the middle of the shorter piston, thus easily creating pistons of the correct lengths. With the leg posed atop ruins it allows you to see the bottom of the knight’s feet, which are actually hollow. This meant that I needed to fill them with some green stuff. I then put a thin slice of green stuff over the entirety of the bottoms of the toes and used a large paperclip to sculpt treads. 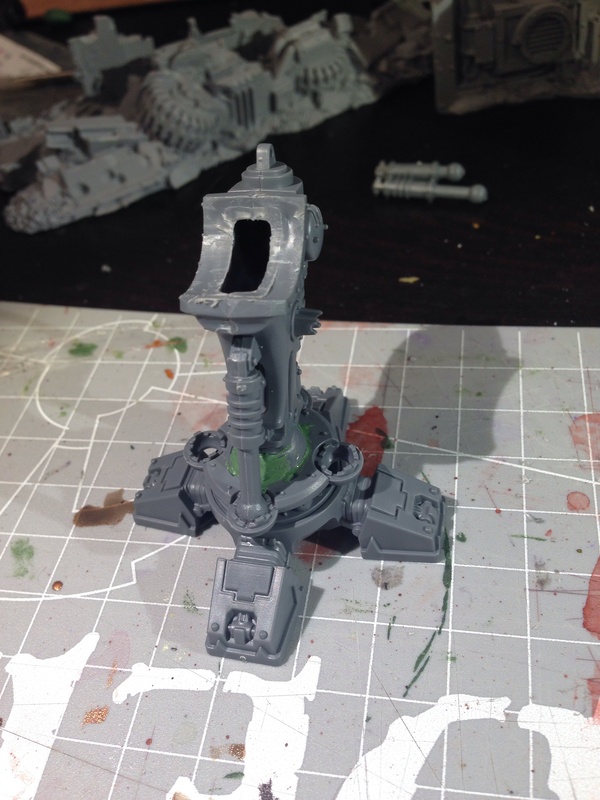 Overall, I am very happy with how this minor conversion turned out. I hope this tutorial helps you to pose your knights more dynamically too. I will be posting some more photos once this model is finished. I was put off by the static legs to begin with. Looking forward to seeing the finished pose with this difficult kit.